Masuko: Mitsubishi needs to accelerate procurement of overseas parts to fight strong yen. TOKYO -- Mitsubishi Motors Corp. is running out of leeway to lower costs to fight a profit-sapping surge in the yen, said Osamu Masuko, the automaker's president. The company will need to speed up efforts to increase procurement of parts from overseas to fight the strong yen, which is holding near its record high against the dollar, Masuko told reporters on Thursday. Japanese automakers are reeling from the rise of the yen, which hit a 10-year high against the euro on Tuesday and is hovering around 102 yen. The dollar is around 77 yen, compared with levels above 85 yen in April. Honda plans to slash exports of vehicles made in Japan over the next 10 years to tackle the rising yen. The move would be in line with Honda's stated plan to sell 80 percent to 90 percent of vehicles produced in various regions around the world in local markets to reduce the impact of currency swings. 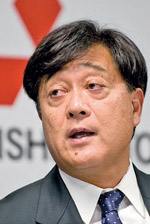 Honda CEO Takanobu Ito told the Asahi newspaper this week that the company would reduce exports from Japan to 10 percent to 20 percent from 34 percent in the business year that ended in March 2011 over the next decade.